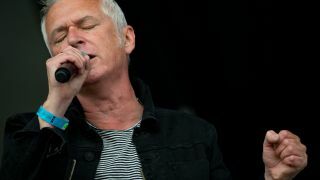 Thunder, fresh from their performance at last weekend’s Calling Festival on London’s Clapham Common, have promised that their upcoming tenth studio album will be worth a wait of six years. “…Let’s go with ‘capable’ instead,” interjects a smiling Bowes. Thunder’s previous album, Bang!, was released in late 2008 and they split up the following summer, only to reunite for Classic Rock’s High Voltage Festival in 2011. Since then the band have toured sporadically and performed annual end of year shows around the country, the most recent of which taking place in 2013 via two sold-out dates at Wolverhampton Civic Hall. Bowes has also toured twice as part of a duo with Thunder guitarist/keysman Ben Matthews (who sat out at the Calling Festival after having his tonsils removed). “I’m really enjoying being back in my Thunder creative space again,” continues Morley, who is keen to stress that the reactivation of Thunder as a recording entity does not affect his other group The Union (whose vocalist/guitarist Peter Shoulder guested in place of Matthews at Calling).